Historical Information Centre Committee at yesterday's event. 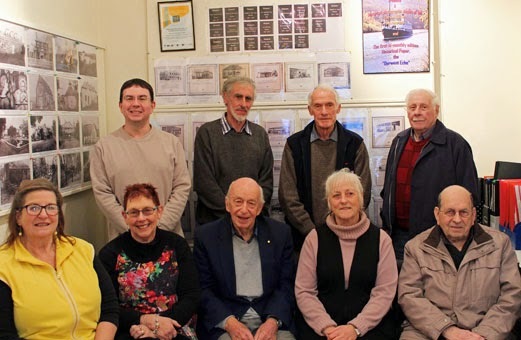 A GATHERING of past and present members of the committee of the New Norfolk Historical Information Centre was held yesterday to acknowledge the work of retiring member Colin Jones. Mr Jones and his wife Wendy were guests of honour at a light lunch in the committee's rooms in the Shoobridge Centre in Circle St. Committee chairman Ruth Binny said it was lovely to see some of the committees former members and volunteers in attendance. "We are here to thank Colin for putting in 16 years of service to the HIC," Mrs Binny said. This extended to all facets of the committee's work, from serving as secretary and writing grant applications, to design and carpentry work. Mrs Binny said Mr Jones had also been an active member of the Derwent Valley Garden Club, Croquet Club, Willow Court Working Group and the Derwent Valley Tourism Association at various times concurrent with his historical committee service. Mr Jones was presented with a certificate of appreciation and a book of maritime maps in keeping with his previous career at sea. Former committee member Vic Barnes presented a framed photo of the committee taken at the time of New Norfolk's bicentenary in 2008 and mayor Martyn Evans presented a token of appreciation on behalf of the council.